As America’s favorite pastime, it suffices to say that honoring the troops at a game is more than appropriate. The men and women of our military are usually mentioned at the beginning or middle of the game, coming on field to receive their well-earned recognition. At the 2013 World Series, retired Sgt. Dan Clark decided to play a more active part in this classic baseball tradition. During the seventh inning stretch at Fenway Park in Boston, Sgt. Clark stepped on the field in his signature Marine uniform. When he opened his mouth to sing “God Bless America,” an unexpectedly booming voice filled the crowd with awe, the love for his country apparent in every well-executed note. After this stunning performance, the clip instantly went viral online with millions of people tuning in to watch the sergeant’s performance for themselves. “God Bless America” was first written in 1918 by Irving Berlin. Twenty years later, he revised his initial version of the song, and singer Kate Smith brought the revised version to critical acclaim with her beautiful rendition. The song has been celebrated by Americans since World War II as it promotes an appreciation and gratefulness for our country. 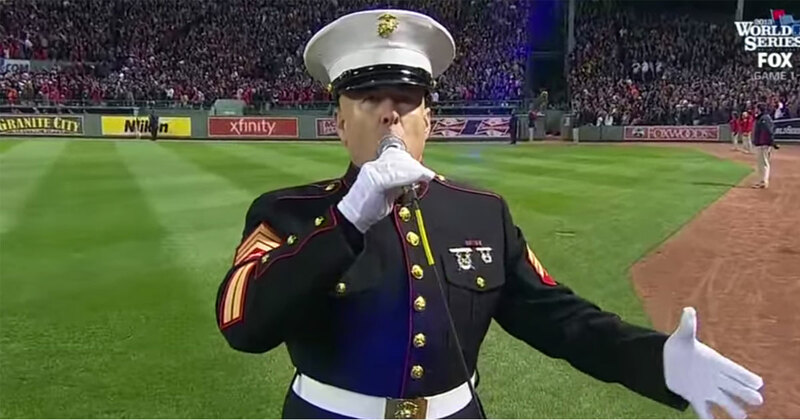 Please SHARE this Marine’s incredible singing with everyone you know.